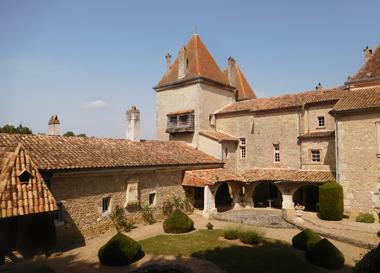 The winner of the 2018 Grand Trophée for the most beautiful restoration went to the Château de Commarque (Dordogne) – a veritable rescue mission. Not an electricity pylon in sight or a modern building for that matter. We are in Périgord Noir in the wild and verdant Beune Valley, which does not seem to have changed since the age man first roamed the earth. Nestled on a rocky outcrop, the partially restored Château de Commarque has retained its mediaeval ‘skin and bones’. However, this Dordogne stronghold is a cut above so many others in the region. Due to numerous archaeological digs, the site has gained an international reputation among scientists thanks to its prehistoric cave (1500 B.C.) and troglodyte village (6000 B.C.). Commarque reads like a history book, starting with the life of cavemen and ending in the era of knights. The rescuing of this heterogeneous site started on 2 September 1943. 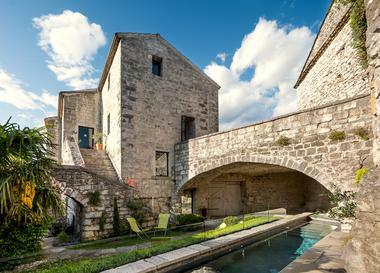 On this crucial day, Commarque became a Monument Historique [NB: a listed building] at the request of the Monuments Historiques’ chief architect, Yves-Marie Froidevaux, an absolute master when it came to mediaeval buildings. In 1962, Hubert de Commarque, the current owner, carried out some work with a party of young students, following in the footsteps of Froidevaux. In 1972, he bought the property that had once belonged to his ancestors, according to early middle age poems. Between the 1970s and 60s, the monument was little more than a mound of stones and earth almost totally overrun with brambles. “The building was clearly disappearing," recalls the owner who then decided to embark on the "madness" of his life by restoring the site. 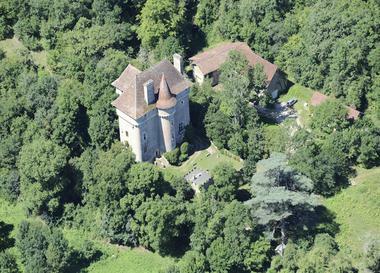 “Fifty years of backbreaking work," he is quick to point out.After clearing away the vegetation and broken rocks and rubble, the consolidation and restoration work began revealing a large proportion of the Château’s walls. Numerous breaches and gaps had to be repaired. From 2015, the restoration of the main part of the site started, including the main building and octagonal stair tower. A few recently renovated rooms have been opened to the public. This massive restoration project won the Grand Trophée prize. Since 2011, and following in the footsteps of several colleagues, Denis Dodeman (chief architect of Monuments Historiques) has been in charge of the restoration project. “It is important to carry out the restoration sensitively without inventing anything", sums up the architect in a few words. However, this quest for authenticity imposes compromises especially with the DRAC (the regional office of cultural affairs) and the general inspectorate of the Monuments Historiques. Hence, the roof of the staircase has been covered in zinc, although it is practically invisible. The walls have not been plastered and you can see graffiti. The Great Hall, a place of pomp and the meting out of justice, has not been rebuilt in order to retain its delineated - even runiform - aspect. It is patently clear how hard this restoration is trying not to end up looking like a Disney castle. Several archaeological digs, carried out with the government and American foundations (including the French Heritage Society), have unearthed alleys and houses built within the confines of the fort. Built in the 9th century, but for the most part between the 11th and 15th centuries, Commarque is an ancient community of fortified manor houses (and tower houses). At least six families ‘co-owned’ the site including the Commarques and the Beynacs, who were constant rivals. The numerous lawsuits entered into between the ‘co-owners’ provide useful and credible archives in terms of defining various the dwellings’ boundaries. Two keeps, one very rare Roman one and a remarkable Gothic one, bolstered the site’s defences along with the moat and ramparts. In the 15th century, the mound typology of the site, which was no longer very effective from a military level point of view, probably explains the gradual departure of the families. Deserted, looted and pillaged, Commarque fell asleep until she was awoken in the 20th century. The morphology of the Beaune Valley, a veritable ‘Eldorado’ in terms of prehistoric sculpture, has changed over the course of history. 15,000 years ago, its elevation was so high that the Chateau’s cave was 20 meters high. This cave revealed Palaeolithic wonders including a bas-relief depiction of a horse measuring two meters from its head to its hindquarters. One of the most beautiful pieces of cave art ever to be discovered. Three-quarters of the unearthed bone fragments are from reindeer, the favourite game of the Magdalenian hunter. Bone fragments from the Bohemian waxwing prove that this area was once semi-glacial as the bird only lives in northern Scandinavia and Russia. Neolithic remains were found in several rooms of the Chapelet de Cluzeaux, artificial caves, which were hewn out of the rock (they did not have any carpentry skills) by the people of this era. In the troglodyte village, archaeologists discovered the oldest kitchen in the world, bunks, coal, etc. While the medieval part of the castle has been open to the public since 2000, the prehistoric site is reserved for scientists. A room in the keep, dedicated to the prehistoric period, exhibits a collection of tools and objects from the period. Visitors can also try their hand at sculpture like the Palaeolithic ‘artists’. There is also information about the work of Abbé Breuil, who discovered the cave in 1915 with the archaeologist Pierre Paris. In the 21st century, valiant seminary leaders replaced the brave knights at the fort. Where once it was Vikings and other barbarians, the only invasions now are from the very welcome flow of some 40,000 visitors a year. The most curious can check out the restoration work. They love it. Jean and Aude de Commarque, both in their thirties, are gradually taking over from their parents Hubert and Christine. Under the impetus of this generation "Y", we should expect the feudal castle to be at least 2.0. All the stages of the restoration have been transcribed into 3D models. The aim is to line the interiors. The Oven House has been restored. The ideal solution would be to also line - with lauses (flat stones) - the Chapel, which has retained its vault. This would be a highly complex operation due to the fact that it overlooks the cliff and can only be carried out on fine days, as the lime mix can not be applied in freezing weather. Much remains to be done and the Château has yet to reveal all her secrets. In the 12th century, before leaving on a crusade, the Lord of Commarque donated the property to the Knights Templar. Could this mysterious Order’s treasure - so sought after - be buried somewhere in the bowels of Commarque? You never know!